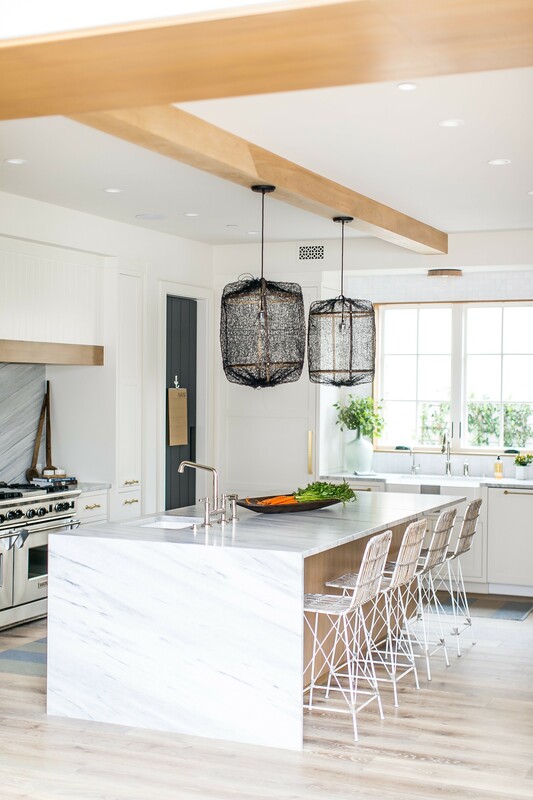 Brooke Wagner's personal kitchen in her new home in Newport Beach, California. That is, until a sample kit of American stones fell into her hands. The soft, undulating surfaces of the honed and antiqued finishes of Polycor’s American marble and natural stones were just the right texture at just the right time. “I didn’t know there were good American quarry options, honestly,” Wagner said. 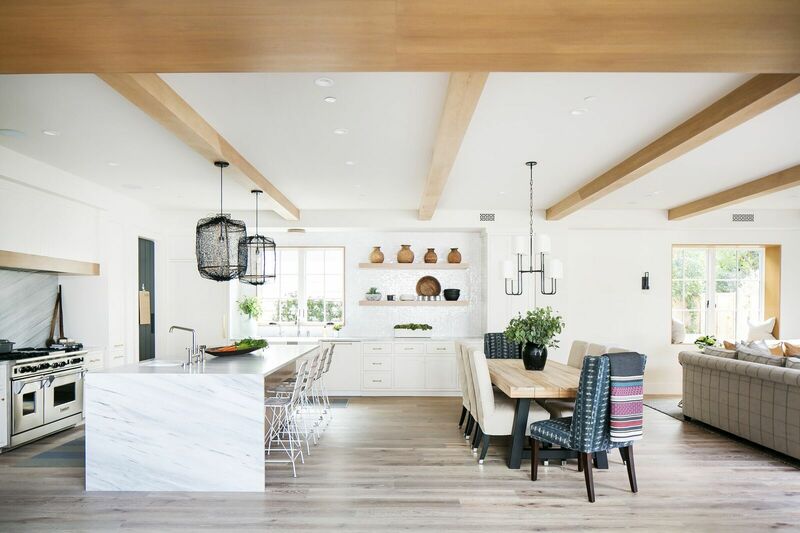 Wagner's design firm based in Corona del Mar specializes in all aspects of the residential design and building process from the beginning planning stages through accessorizing and staging. Natural stone plays a large role in most of her designs, though until now she was sourcing stone outside the US. Brass hardware by Modern Brass will patina with age. For Wagner, the wearing of elements like brass, marble and wood add to their beauty. "Nothing can compete with a piece of natural stone marble, limestone or soapstone. Even though quartz has gotten really good over the years I can always tell the difference. I had white marble in a past home. Aesthetically, you can’t beat it." Wagner said. Like many designers, Wagner wants to get as far away from the polished sterile look of previous trends. She now opts for honed marble that offers a natural look but is still a perfectly level surface to roll out a pie crust. But for her own space, Wagner went for it with a 10 foot waterfall island in antiqued White Cherokee American marble. Where she went big on texture, Wagner took a more sublte turn on stone pattern to keep the space soothing even as she used large slabs of the marble. Wagner personally chose the block of stone that her slabs would be cut from, selecting a uniform striated pattern. "I don’t like the wild veining when it feels out of control. I like more mellow, especially when you’re doing a lot of it," she said. Marble from Polycor's quarry is available in a variety of vein patterns from subdued to highly figured. This stone was sourced through Stoneville. Because Polycor owns it’s 30 quarries and 12 factories, it's are able to process it's own blocks and custom finish slabs, offering a variety of textured options which not many companies offer. The antiqued (also called brushed and leathered) finish is gaining popularity in marble, granite and soapstone for its smooth and pronounced natural rock feel. 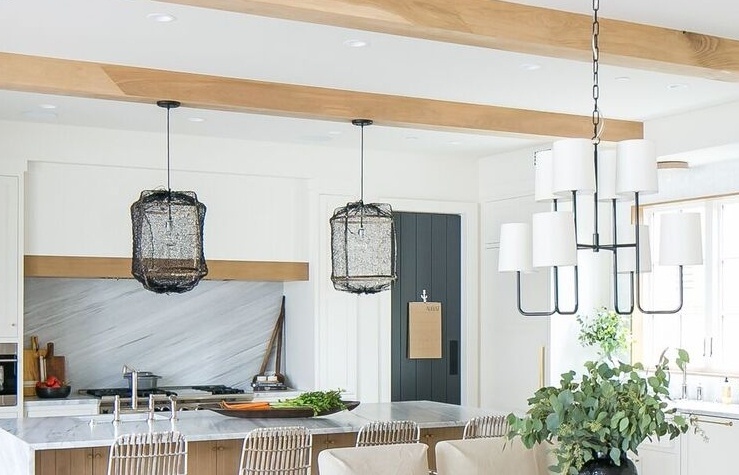 Island pendants Global Lighting’s Ethos collection. The White Cherokee backsplash is a continuous slab sliced down to 1 cm and reinforced for strength. White Cherokee marble comes from Polycor’s Tate, Georgia quarry. Each one of Wagner’s slabs were cut from the same block to ensure consistency from slab to slab - even the large 1 cm piece for her stunning backsplash. "They sent me photos when they cut the White Cherokee. It was fascinating to see it cut from the block," she said. A backsplash like this is a tricky wall-to-wall install for a fabricator (and this is actually between finished end panels and a custom hood). The sheer weight of a traditional 3 cm slab of marble in this applicaion is challenging enough. Working and reaching over top of base cabinetry and maneuvering a slab between finished cabinetry without scraping an edge is a back breaker (and a nail biter). The 1cm thin slab helped achieve a tight fit without the headache. For the island, fabricator Fred Paulk cut the side slab on a 45 to continue the vein of the countertop and made a seamless mitre on one end. The faucet is by Kallista. By choosing a 1 cm reinforced slab, Wagner saved hundreds of pounds of weight that her fabricator would have had to negotiate over the range opening and finished tops, plus, saved wasted, excess material that wouldn’t be seen in the final design anyway. Fabricator Fred Paulk of American Marble and Tile was able to just tilt the finished piece easily into place without damaging any of the surrounding surfaces. Because Polycor controls the raw material, it’s able to tailor slabs to a designer’s needs without sacrificing vision. The extended overhang of the waterfall island makes the underside of the stone an added feature, showing off the marble's natural qualities. The barstools are by Safavieh. 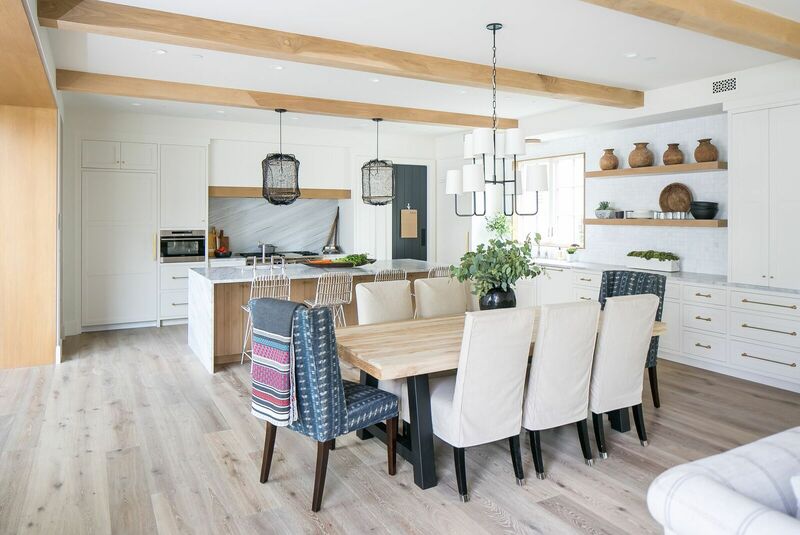 The dominating island is cantilevered on one side, a striking element above the warm toned European wire-brushed white oak flooring. The 60 inch island provides a deep workspace, but is narrow enough for family members to reach to the middle. For the full wall backsplash, Wagner chose a 2 inch handmade Moroccan tile provided by Famosa. 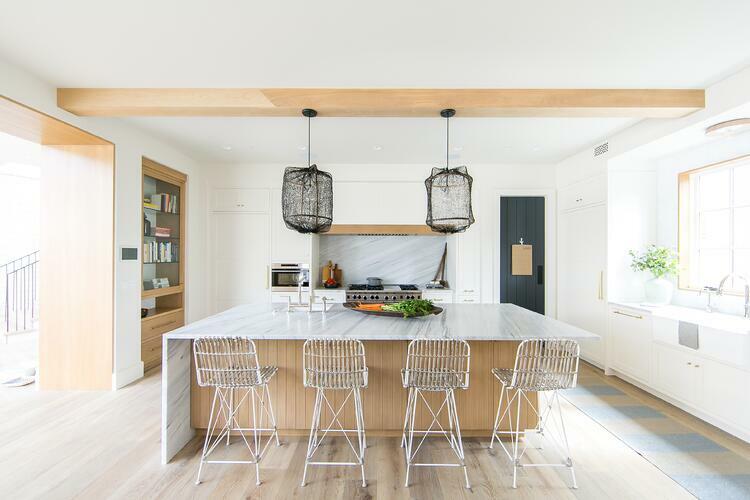 The raw white oak fixture above the sink is from Urban Electric. "In the kitchen I was going for a timeless look. I wanted to showcase materials like the wood and tile," Wagner said. "The Morroccan tile has a lot of texture. It's handmade and I wanted to see the irregularity of that and let the rest of the kitchen be a mellow back drop." 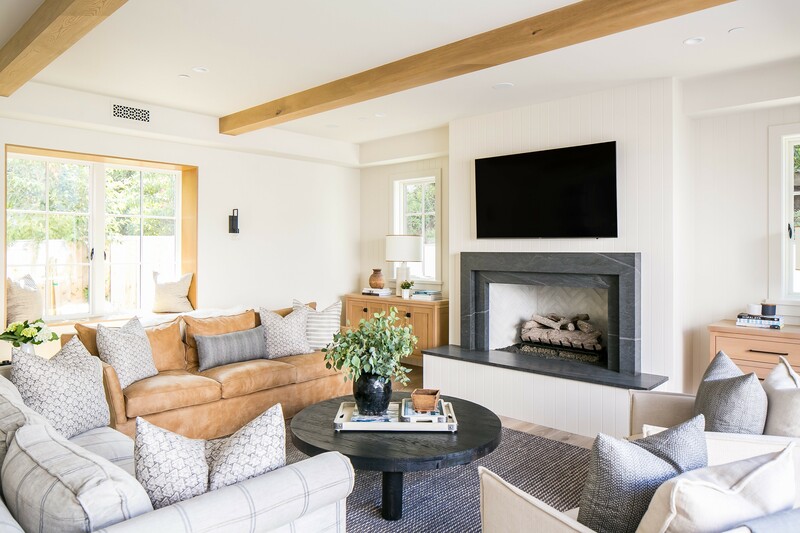 Throughout the rest of the home the warmer organic elements like light woods, natural stone and textured elements continue, puncuated by clean modern architectural elements and black accents including modern grid style windows, railings and a black granite fireplace in the adjoining great room. In the great room, tongue and groove paneling provides a clean backdrop for an American Black granite fireplace. The stone is from Polycor's Pennsylvania quarry and was supplied through Arizona Tile. With a subtle marble like character to it, American Black granite is an ultra hard wearing natural stone. The material doesn’t have the typical, angular-grain mineral structure of other granite or a wild veining like quartzite. It’s got all the subtle flowing movement of a soft marble, with none of the maintenance like etching or staining, making it an ideal choice for a fireplace. 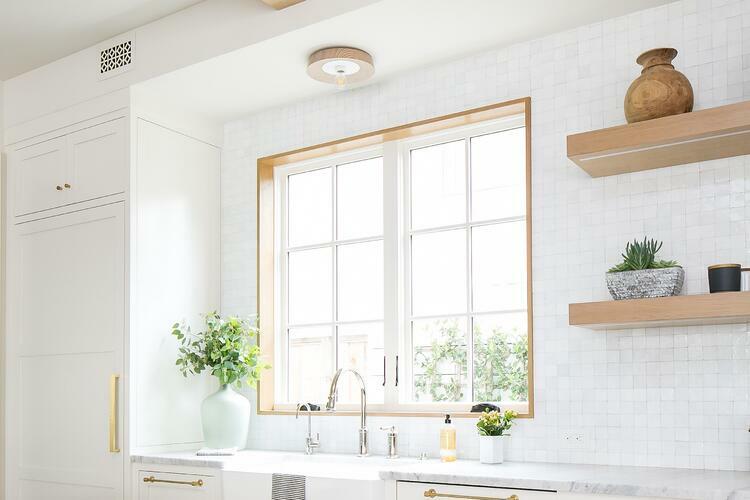 Wagner's family home receives generous natural light thanks to architect Chris Brandon of Brandon Architects, Costa Mesa. "I wanted the home to be clean-lined and transitional on the interiors. The architect did a great job mixing traditional and modern on the exterior and we wanted to keep the same look running through the interior," Wagner said. 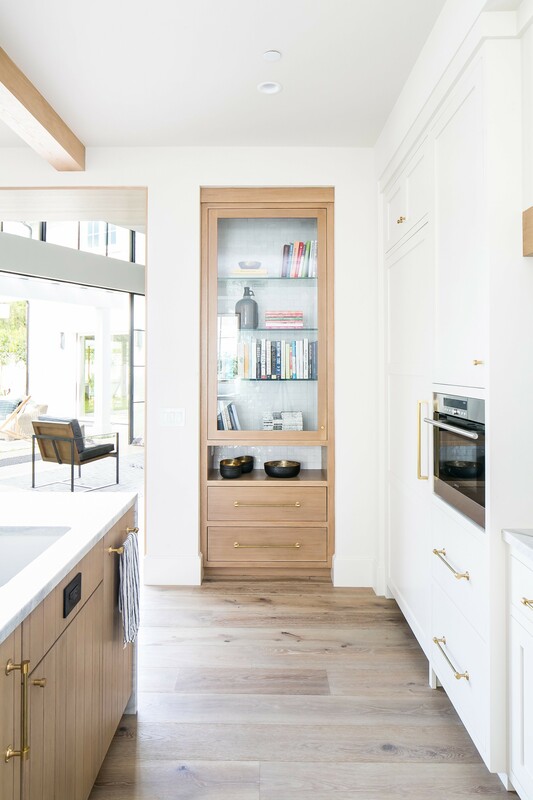 "I like things to feel light and we do get lots of natural light in this house which I wanted to offset with warm tones of vertical grain oak. I do like light and bright spaces." Wagner and her family are just settling into their new home. That's always kind of a magical time, getting to know your space when everything is all shiny and new. But the best is yet to come. There will be holidays and family movie nights, celebrations and serious discussions, all of which will likely happen over that big, beautiful island. It's in for some heavy use, but Wagner isn't worried. "Some people are afraid that if it changes at all it’s ruined. To me, it’s a natural material and it will change over time and it will get etching and marks on it, but that is part of the natural beauty -- that it will evolve and change." American marble, limestone, soapstone and granite are at a quarry near you. Request a sample set and see them for yourself.